In this video, I describe what is a cryptogenic stroke and its connection with atrial fibrillation. A crypotegenic stroke is basically an explained stroke, and can be linked to undiagnosed atrial fibrillation. A cryptogenic stroke (CS) is technically defined as cerebral ischemia (stroke) of obscure or unknown origin. This is basically a fancy way of saying that a patient has had a stroke, yet doctors have not determined a cause. The cause of CS remains unknown because the event is transitory or reversible, medical tests have not been exhaustive, or because some causes truly remain unknown. One-third of the ischemic strokes is cryptogenic. This is not uncommon to find a patient with a cryptogenic stroke. Patients often come to me with a history of one or more strokes of an undetermined cause. They've been in the hospital. They've had MRI's done on their head. They've undergone testing that looked for blockages of the arteries of their neck or their head. They've had a heart testing done (such as an echocardiogram) that showed no significant valve disease or no holes in your heart. Many times they’ve even worn a heart monitor for several days, which did not reveal any arrhythmias. After these tests have been completed and the patient is feeling better, they end up getting discharged and sent home. The end result of this process is that the patient had a stroke yet the cause is still undetermined. In these patients, the reason for the stroke may be undiagnosed atrial fibrillation (AFib). The difficult part of these situations is that in order to make care adjustments to better prevent another stroke caused by AFib, a doctor must actually catch an AFib episode while the patient is in the hospital to be sure the patient has the condition. Often times, even when people are in the hospital for several days, they may not have any AFib episodes, and therefore the condition continues to be undiagnosed. Studies have shown that when people have had a cryptogenic stroke it can take over 80 days of monitoring to be able to actually catch an AFib episode and diagnose the condition. What I emphasize to patients when they're in the hospital with a new stroke and we’ve not found a clear reason, is that they require further testing after discharge. The testing may need continue outside of the hospital, to see if there's any undiagnosed AFib. This additional testing is needed to make sure patients are diagnosed properly and to make sure they are placed on the right medications to prevent any future strokes. 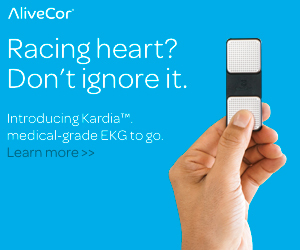 Typically, after a hospitalization, patients may start off with simple heart monitors that go on top of your skin to see if there's any evidence for undiagnosed atrial fibrillation.However, these heart monitors on your skin are only designed to last about a month at most, which may still not pick up episodes of atrial fibrillation (as I mentioned previously, it may take as long as 80 days). Sometimes patients need this longer monitoring. In those cases, there are monitors that go underneath your skin called implantable cardiac monitors or implantable loop recorders. These types of monitors can last for up to three years (in terms of a battery life) that can help your doctor figure out if you have undiagnosed AFib and get you on the right treatment strategy to prevent a second stroke. Once you've had a stroke, determining the cause during this extended testing phase is a crucial step in preventing future strokes. So, if you've had a stroke and your medical team has not discovered a clear underlying cause despite going through neurology and cardiac testing, please discuss with your doctor the possibility of having undiagnosed atrial fibrillation. This will also trigger a discussion regarding any additional testing that may be required in order to make the diagnosis. Newer PostCan Atrial Fibrillation Be Cured? Older PostWhen Should I See an Electrophysiologist?